Poverty food diet was one of the phrases used to highlight the results of a study recently published in the British Medical Journal (BMJ), which detailed how Cubans shed an average of 5.5 Kg in weight during five years and allegedly became healthier. Participants from the central-southern city of Cienfuegos were sampled and monitored during a period when they ate less meat, walked and cycled everywhere and as a result rates of cardiovascular disease and diabetes were lowered. To the West and Britain, such achievements look like a model to be imitated. The five years of results coincided with the economic crisis of the early 1990s, labelled “A Special Period in Peacetime” by the Cuban government. As the study was also commented on and celebrated in the British and Spanish press, Cubans on the island and its diaspora turned to the social media to vent their anger and disbelief. Many questioned the findings, but others just could not comprehend how the difficulties of an imposed lifestyle could be taken as a recipe for health improvement. Some friends seized the controversial moment to post old pictures from 1993-1994, the acutest years of the Special Period. Just looking at those elongated faces, pale and hollow, seems enough to evoke the painful memories of those long months. For many of my former colleagues at the University of Havana, their photos hardly document a healthy period. “Are you ill?” was a recurrent question many were confronted with during the weeks they were forced to train as soldiers, as if they had been drafted into the army. University students in Cuba had to serve in military units before graduation as part of their preparation to defend the homeland in the event of an American invasion, which after the collapse of East-European socialism was always “imminent”. Based on the BMJ study, it would not be only extremely sarcastic but also downright cruel to affirm that my colleagues had never been healthier than in those days. Of course they experienced hunger, as the rest of the population, but owing to a national dictum of self-determination, many hoped for the best and buried their personal accounts of malnourishment. Then, years later, food production was slowly recovering and stories about the Special Period gave way to those illustrating the increasing contrasts of post-soviet Cuba. My colleagues, like many young educated nationals, fled the country and ended up in the most unimaginable corners of the globe, where food was abundant and varied, and health choices did not depend upon an overbearing nanny state. Food recollections were left for sporadic reunions when the difficult years were remembered briefly as a validation for solidarity or friendship. On a hot humid afternoon in May 1994, while sipping a drink made out of vanilla extract, my friend Martha summarised, in a prophetic manner, the future of our memory of those days. “Can you imagine”, uttered the dejected twenty year-old journalism student, “that we would have to call each other to verify our anecdotes of this period, because nobody is going to believe us!” And she was right. Not many people know that the stories of food scarcity in Cuba are not just a consequence of how little it was reported in the global press. It is also because we did not tell those stories. As though there was a sort of embarrassment attached to the act of remembering that had more to do with private attitudes rather than with the state’s responsibility, Cubans suppressed those shameful memories. In the summer of 1994 there were riots in El Malecon that prompted the Balseros crisis and 125, 000 famished Cubans left the island. Even in those difficult days of hot confrontation and macho-imbued revolutionary rhetoric, some thought that emigration would have a positive effect in the distribution system and that those who remained would be rewarded with increased rations. There had not been many stories about food scarcity in the official press, (the only one available) during the Special Period. Following the traditional dissemination of positive images instead of those reflecting the harsh reality, Cuban news programmes showed endless reports of food production, record-breaking farmers who took enormous pride in being portrayed as heroes rescuing almost extinguished food and vegetables. A popular joke at the time suggested going shopping on the 8 o’clock news, because that was the only place where groceries could be seen. Cubans had not been used to seeing themselves as hungry or poor. Those who had lived through the 1980s, a decade of relative prosperity if compared with the previous ones, were accustomed to associate pictures of starvation with the faraway lands of the Horn of Africa. Few compared themselves with images seen in philanthropic video-clips such as We Are theWorld. It seemed an impossible task, especially because after exhausting the work hours securing foodstuff, when gathered in front of the TV set, those in the privileged neighbourhoods with electricity, refused to watch more suffering on their screens. 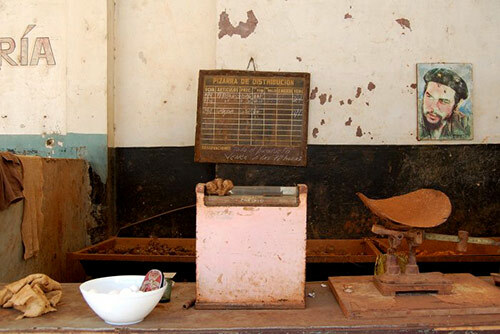 Cubans preferred the exuberant settings shown in the Brazilian soap operas, where emotional conflicts appeared more important than their daily struggle for food. Hope came to every house in the long saga depicting the divided social worlds of Rio de Janeiro. Nothing gave more optimism than the social-climbing pursuits of Maria de Fatima, aiming to penetrate the upper echelons of a highly competitive super rich Carioca clan. Even the famously long prime time TV speeches of Fidel Castro were watched not because they would bring relief, but in the hope that, if shorter than three hours, they would show the corresponding episode of Vale Todo. Then, for about 45 minutes, the day’s problems could be forgotten. Such escapism was preferred to having to visualize how everybody was losing weight and becoming obsessed with the recipes of the past, which were impossible to replicate due to the lack of the main ingredients. Aiming perhaps, at contrasting the success of foreign productions, Cuban dramatist were called to compete with stories of the present, but national telenovelas, such as Retablo Personal, were never very popular during those years. TV viewers simply refused to revisit their daily misery. Food, or the lack thereof, seemed to occupy every corner in people’s mind. There were the perennial jokes about the lost dishes of Cuban cuisine, in which the national inventiveness had turned restaurants into museums. The metaphor appeared valid since food could only be found in people’s memory. The future was being turn into a collective plot for a horror movie. Rumours flourished, coupled with everyone’s ability to put on a brave face. In power circles they talked about “option zero”, supposedly the point of no return, when the struggling distribution system would have totally collapsed and meals would have to be prepared in giant communal pots in the streets. To complicate the picture, unheard-of ailments spread all over the island. An epidemic with clinical manifestations of optic and peripheral neuropathy affected more than 50, 000 people. Doctors cited an acute nutritional deficiency among its causes. The authorities grew desperate. The obsolete centralised distribution system had been conceived for better times, as if the small Caribbean nation were an oil-rich Gulf state. With increasing fuel shortages, big cities reduced their public transport and those depending on agricultural imports were hit the hardest. Certainly, as the professional in the BMJ argued, Cubans had to opt for more eco-friendly means of transportation and a fleet of Chinese bicycles suddenly invaded the country, but Cubans lacked the ability of their Asian counterparts to utilise their bikes on a par with a lorry. Uncertainty and despair were the predominant moods, some would say, but Cubans excelled at being creative. Food inventions were passed on like family recipes. Some were tested in the safe environment of the house kitchen, where mothers and grandmothers could validate that they were edible. That is why we had picadillo (mincemeat) made out of plantain peels, potato pizzas and fried eggs in hot water, instead of with oil. No wonder the fat intake was also reduced as the BMJ refers. The selling of food was still illegal in the early 1990s, but adventurous street vendors managed to make a living (risking going to jail) where food was even scarcer and “scarier”. Some were caught and we learned about their inventions through notes printed in the daily Granma. There we read about a woman in Havana who used old rag mops as the main filling for her croquetas. Food substitutes as such had never entered Nitza Villapol’s imagination. By that time, the well-known Cuban food guru and TV cook had seen her show axed after more than thirty years on air. Her book Cooking in One Minute was the closest to a food bible on the Caribbean island and through its pages, especially in the reprints of the 1980s, food enthusiasts learned how to substitute ingredients in her recipes if the main ones were not available. Granma, the main organ of Cuba’s Communist Party refused to inform us about food changes and innovations, but we could always turn to the creative country’s intelligentsia as a further reassurance of not being disappointed. Many writers filled the gap left by the official media in narrating the national history of hunger. Short stories published in cultural publications that sadly not everyone read, featured descriptions about reduced portions and long-lost desserts. Foraging for food remained a gruelling task throughout the early 1990s and few Cubans, for example, felt the need to leave home, get on a bicycle and attend a theatre play or go to the cinema. Those who stoically maintained their cultural habits were surprised to find that food scarcity had inspired interesting pieces that could be revealingly abstract (Marianela Boan’s Fast Food) or disturbingly honest (Alberto Pedro’s Manteca). Audiences were exposed to an aesthetic of food shortage, which wanted to delve deeper and show perhaps how dehumanizing the lack of food and the increasing loss of commensality had turned everybody into a skeletal version of themselves. However, Cubans persisted in denying that vision and like, in other difficult times of the island’s history, many preferred to listen to music and dance. Timba orchestras had exploded and the salsa-dancing frenzy enabled my fellow-compatriots to burn their meagre reservoir of calories dancing to tunes with plain lyrics like Picadillo de Soya (soy mince), one of the hits of NG La Banda in its heyday. In early 1994 the Cuban government imposed several “pro-capitalist” measures aiming to fix the country’s ailing economy. Cubans were allowed to set up small independent venues to sell food or to convert rooms in their houses into small restaurants. They were called paladares, in reference to the most followed Brazilian soap during the most “special” days of the Period. The government also legalised the possession of hard currency and gambled its future on foreign investors and joint ventures. International tourism was another priority and dozens of big 5-star hotels sprung up on the island’s coastline. Tourists were lured in with the promise of a crumbling colonial splendour, pristine beaches and friendly hosts, but holiday brochures mentioned little about food. The booming tourist economy attracted many Cuban professionals who saw in the newly built hotels and bungalows another chance to escape their dilapidated surroundings. Tales about food imports to supply the tourist industry justified more than one career change. Then there were chambermaids who previously had worked as teachers; porters, who had been university professors and even doctors who seemed happier as taxi drivers. After many years of limited provisions, their families could experience again the joys of a full fridge and a kitchen table groaning with treats. Hotel building rates were amazingly fast, but not everybody could be hired to work in the tourist sector. Cuban nationals were not allowed to rent a room or visit the areas limited to international visitors. The island’s main touristic hotspot, Varadero beach, was often referred as “another country” in the popular imaginary. For the rest of the population, paladares were the preferred place to sample forgotten dishes and snacks, since the state-owned cafeterias could hardly compete with the private food stalls. When the authorities realised that vendors profited from food sales, they imposed heavy taxes and sent health inspectors to charge huge fines if the food preparation appeared to be compromised. Food poisoning cases were talked about, vox populi, because newspapers and the official media only reported extreme cases. In one of the most tragic, fourteen people died in 1999 in Manguito, Matanzas, after eating fritters mixed with a fertilizer powder mistakenly bought as flour by the paladar owner, who also ended up as a casualty. Dozens of other people were treated with symptoms of food poisoning, prompting a health scare and lots of other rumours about the possible fatal ingredient used. It was never identified in the national press; however, later that year Fidel Castro chaired a meeting with Cuban journalists and briefly mentioned “off-the-record” the case and the culprit. Such news never made it into print. At that time visitors came in droves, staying at “luxurious” resorts separated from the difficulties of everyday life Cubans were still enduring. The Special Period had entered its first decade and there were not any official acknowledgement of such a milestone. Food was still difficult to secure for Cubans, but there was a kind of collective agreement in that the harshest days of the crisis belonged in the past. It must have been puzzling for tourists who ventured on a “budget” vacation to Cuba, to sample what locales ate. They probably had read the tourist guide to get acquainted with social codes and customs, but after landing, the majority must have realised that the country remained a challenge. But now they could stay with a Cuban family in a casa particular, breakfast included. What they ignored was that their menus had been carefully revised to suit their tastes as some hosts could take offence if visitors rejected “Cuban food”. Tourists may had come looking for “Caribbean” similarities: spices, jerk chicken, callaloo, varieties of fish dishes, so it must had been a shock to realise that none of those foodstuffs were consumed in the larger island of the Greater Antilles. These days some foodstuffs are easier to get on the island, provided that one can afford them. Many Cubans do not look as emaciated as their 1993 compatriots and perhaps they have come to realise that excessive body fat does not correspond to a healthy lifestyle. Two decades have passed since the authorities declared the Special Period. It seems an awful lot of time for some, especially for the millions of Cubans who have survived it and changed their attitudes to nutrition in the process, through an excruciating and delayed learning curve. Posted by IvanDariasAlfonso at 3:19 p. m.
Labels: British Medical Journal, comida cubana, Cuba, Período Especial, The independent.